Life gets pretty boring when you can beat the snot out of any villain with just one punch. Nothing about Saitama passes the eyeball test when it comes to superheroes, from his lifeless expression to his bald head to his unimpressive physique. However, this average-looking guy has a not-so-average problem--he just can't seem to find an opponent strong enough to take on! Despite just finishing a martial arts tournament and immediately dealing with the Monster Association invasion, Saitama is still so incredibly strong that he feels empty inside. King lectures him on how to live like a hero, but it doesn't help. Meanwhile, servants of the Monster Association close in on Speed-o'-Sound Sonic! 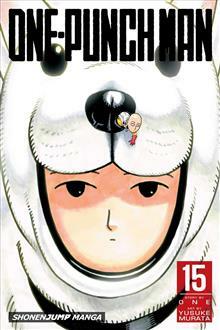 Manga creator ONE began One-Punch Man as a webcomic, which quickly went viral, garnering over 10 million hits. In addition to One-Punch Man, ONE writes and draws the series Mob Psycho 100 and Makai no Ossan. Yusuke Murata, a highly decorated and skilled artist best known for his work on Eyeshield 21, won the 122nd Hop Step Award (1995) for Partner and placed second in the 51st Akatsuka Award (1998) for Samui Hanashi.